There’s nothing wrong with nice homes, new cars, vacations and dining out. But a big lifestyle often comes with big rent or mortgage payments, and may require big jobs and more stress. Maybe you prefer a less conventional way to put a roof over your head, in terms of both how you pay for it and what kind of roof it is. And maybe you want less expensive and more interesting ways to live in general. For example, you could spend your life as a house sitter and caretaker to get the advantages of living in nice homes without the financial obligations of owning a place. Or, if you want a more temporary change, you might live in a bus and travel the country for a year before settling down. 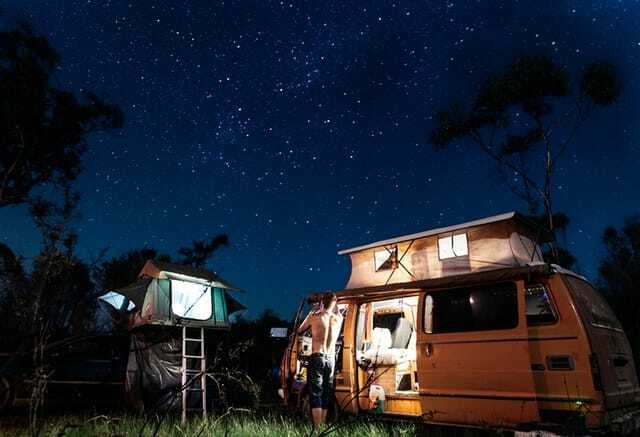 Whatever your goals, here are some real-life examples of alternative living. Would you try any of them? Nancy Bolam says she was paying $500 per month for an unheated bedroom in a trailer outside Aspen, Colorado — and it didn’t have a closet or a door! So she decided to try camping for a while, instead. She bought a fabric dome, and ran power to it from a friend’s nearby garage. She heated it with a woodstove and carried in the water she needed. After living this way for more than three years, she had saved enough for a down payment on a house. After discovering how expensive rent was near his new job at Google, 23-year-old Brandon (last name withheld) bought a box truck to live in, reported Business Insider. His 128-square-foot living space includes a bed, dresser and places to hang clothes. He showers and eats on the Google campus and leaves the truck parked there, as well. Brandon says this works because he really only sleeps in the truck. And he figured he’d quickly recover the $10,000 he paid for the truck because he’ll save more than $2,000 on rent each month. He details everything on his blog, FromInsideTheBox.com. A truck is a pretty minimal shelter, and a fabric dome even more so, but Daniel Suelo doesn’t even own a tent. He doesn’t even use money, according to The Atlantic. Suelo is homeless by choice — and sometimes lives in caves near eastern Utah, or in the Sedona, Arizona area. He forages for wild foods or searches dumpsters, cooking his meals on stoves made of discarded cans. He drinks from streams. He’s had some trouble with the law due to the 14-day limit for camping in any one place on BLM (Bureau of Land Management) lands, but mostly he stays out of sight so he’s left alone. Suelo sometimes works as a house sitter. He’s also spent time living with anarchist squatters in Portland, Oregon, and in communal homes. But he spends most of his nights outside, and he’s been living this way for more than a decade. It can be costly to travel much in an RV, so he suggests alternating between working and traveling — while still living in your RV, of course. Check out our list of 103 ways to make money at home for more ideas to work from your home on the road. Yes, you can live on a sailboat inexpensively — if you do it right. HoboSailor.com’s Leann and Chad say it means buying a cheap used boat, sticking to free places to anchor and budgeting well. Their lifestyle, which includes a cat and a large-screen TV on their small sailboat, runs about $1,000 per month. Nobody is likely to recommend living in a storage unit as a permanent housing solution, and there may also be legal issues. On the other hand, people do sometimes choose this lifestyle out of necessity for a few months at a time. Consider Becky Blanton’s story. When her freelance writing income declined, she put a bed in her 10-by-20-foot storage unit and moved in. The managers of the facility chose to say nothing. After four months working various jobs and eating at cheap buffets, Blanton saved up some money and found more conventional housing. She has no plans to buy a home. In fact, she recently decided to drive around the country and look for a new place to live. “I’m addicted to the freedom of renting over buying, as are many of my friends and peers,” Robinson says. For a while, she’ll be living in hotel rooms. There may be a trend toward more-nomadic lifestyles, thanks to the many options for working online (and due to less job security). Of course, the cost of such a lifestyle depends largely on what kind of places you rent. Your Turn: Would you consider any of these low-cost alternative lifestyles? 38 Minutes Ago Dear Penny: I Can Only Afford Interest on My Student Loans. What Can I Do?